The British concept of meat and two veg meals doesn't exist in Syrian, and the rest of the Middle East, cuisine. We don't use vegetable boiled or steamed as a side to the meat. Traditional Levantine cooking uses meat and vegetables cooked together in a stew type dishes served with rice or Bulgar. For every meat based dish there is an "Oil" counter part. These dishes are usually served as side dishes at room temperature or part of a mezze. They are called "Oil" dishes as they cooked in olive. Almost every kind of vegetable can be cooked this way; runner beans, broad beans, spinach and today's vegetable Okra. 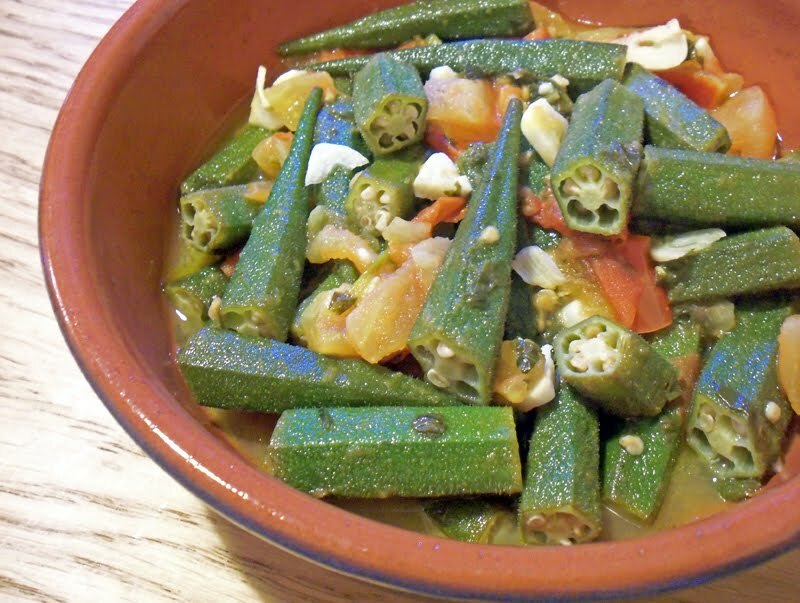 Okra or Bamyeh as it is know in Syria is a very popular vegetable in Middle Eastern and East Mediterranean cooking. Traditionally it is cooked with lamb cubes in a tomato-based stew and served with rice. Today's recipe is Bamyeh Bi Zeit or Okra in Olive Oil a meatless counterpart. It is not as frequently cooked but as delicious if not better. I find bamyeh bi zeit at its best if cooked and left in the fridge overnight for the flavour to develop. Next day take out of the fridge let it get back to room temperature and enjoy it with Arabic bread. Heat the olive oil on medium heat in a heavy bottom pot. Chop the tomatoes roughly and add to the oil. Chop the okra and very thinly slice the garlic. Add to the pot. Season with salt and add a little hot water to cover the bottom of the pot. Cover and cook for 10 minutes. Once the vegetables are cooked and most of water has evaporated add the chopped coriander. Mix and cover for another 5 minutes. I have to say, Bamyeh is not my favourite of dishes, but I do prefer the smaller variety used back home to the rather large ones they have in the United Kingdom. Are they different species or is something done to make them smaller? Is there even a difference in taste? Coll bam-eh ou nam-eh be sa-la-meh. Okra is often used here with vegetable dishes. It might not be my favorite but it taste good with other veggies. This recipe is really a must-try. I thought the small and large are two different verieties of Okra but according to Wikipedia the small ones are simply harvested earlier. I personally prefer the small variety we get back home in Damascus. Do you know in Deir Al-Zour bamiyeh is the "national" dish, and they use the large ones. Hence the name Bamiyeh Deriyeh for the large okra variety. I like that! I didn't hear that one before. It must be an Aleppean thing. Welcome to my blog! If you are not a fan of okra this dish will change your mind. Very nice with fresh clean flavours. This sounds great. I always have trouble getting Okra right when preparing them myself, but I hope this will help. I've never really liked okra much - it's that slimy quality it has, but I did manage to enjoy this dish when it was cooked by a Syrian! I know what you mean. Okra does tend to get slimy especially if overcooked. I don't know if you can tell from the photo but I just cooked it. I like my vegetable a bit crunchy rather than cooking the life out of them. The other solution, which we use in Damascus, is not cutting the okra at all. We use the small okra variety in Damascus which makes it easier. Welcome to my blog. I am so glad you liked the dish. I was reading Oyter Food and Culture and it's great to find your blog. there are many dishes we share( I'm from Turkey). Okra is called Bamya in turkish. Even the name is almost the same, isn't it? It's one of my favorite vegetables unlike most people. And I like it in olive oil without lamb cubes. Both are made in Turkish cuisine. We never chop it though not to cause it to get slimy. But yours look so appealing to me. Welcome to my blog. It is Bamia or Bamya in Arabic whichever way you want to spell it. We don't chop it in Damascus traditionally but we use the small variety. Turkey is high on my list of places to visit. I went to Istanbul when I was seven years old. I loved it as a child. Now I need to go again as an adult. I Looooove this dish, but I'm amazed that none of the recipes I've found includes how to make the okra slime-free. My sis-in-law (who is middle eastern)told me to roast them in the oven on a cookie sheet til brown, and it works!! Thank you for the tip. I should give that a go! Welcome to my blog and apologies for the very very late reply. I am so glad you liked the dish.